Much as I’d like to believe that these lines describe yours truly, they actually begin The Rolling Stones song Sympathy for the Devil, a tune which constantly popped up in my head while I was reading my contribution to the current Classics Circuit. E.T.A. 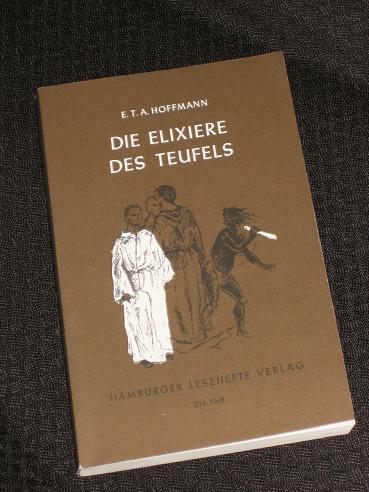 Hoffmann’s wonderful Gothic novel Die Elixiere des Teufels (The Devil’s Elixirs) is written in the style of an autobiography, a parchment discovered in a monastery and supplemented with various other documents by the publisher, and it follows the life of the monk Medardus – a man who (as you will see) has more than his fair share of problems with the man downstairs. Medardus begins life as plain old Franz, a young boy who has grown up without a father, but with an unwelcome legacy. His father had apparently sinned greatly before meeting his mother, and it is Franz’s mission to atone for the misdeeds of the father by devoting his life to the church (a path suggested to him by a meeting with an old painter he encountered in his youth). He grows up and enters a monastery, and it is there that he learns of the legend of the Devil’s Elixirs – a story which will have a shattering effect on his future, and which is inextricably linked to his past. As Medardus goes on his merry way, pursued and accompanied by the devil inside, he manages to get in and out of his various scrapes, encountering many people who have interesting tales to tell him. Interestingly, most of those stories are actually about Medardus himself, as a figure from his past (or his future) has already been where he is now. Many a conversation turns into a story about a monk who had been up to no good somewhere in the vicinity (which often makes for uncomfortable hearing for our religious friend). Have you heard they're reforming, poss new material etc. What – plenty more Hoffmann fans! A few years ago I made an attempt to read everything available in English. I got pretty close. I read this years ago and liked it a lot. Nobody writes the uncanny quite like Hoffmann. I like all of Hoffmann and am lucky to have an old edition, with all the bits and pieces in the right place. It's sacrilegious to leave those connecting bits out. Tom – Of course, I knew you were a fan 🙂 I have a copy of The Serapion Brothers (in German) on my Kindle. As it's about 800+ pages though, I doubt I'll get to it for a while! Caroline – I had a similar issue when trying to download an original copy of Goethe's 'Unterhaltungen deutscher Ausgewanderten' (which copies Hoffann's trick of linked stories). All the e-versions were massively cut – I ended up copying a HTML version on to Word, PDFing it and uploading it to my Kindle!